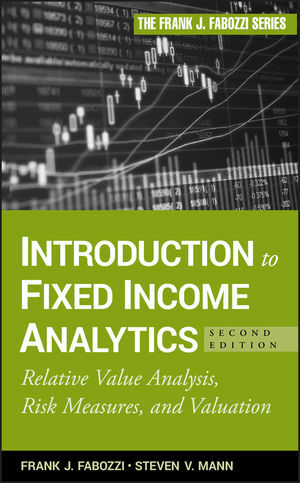 The First Edition of Introduction to Fixed Income Analytics skillfully covered the fundamentals of this discipline and was the first book to feature Bloomberg screens in examples and illustrations. Since publication over eight years ago, the markets have experienced cathartic change. That's why authors Frank Fabozzi and Steven Mann have returned with a fully updated Second Edition. This reliable resource reflects current economic conditions, and offers additional chapters on relative value analysis, value-at-risk measures and information on instruments like TIPS (treasury inflation protected securities). Understanding fixed-income analytics is essential in today's dynamic financial environment. The Second Edition of Introduction to Fixed Income Analytics will help you build a solid foundation in this field. FRANK J. FABOZZI, PHD, CFA, CPA, is Professor in the Practice of Finance and Becton Fellow at the Yale School of Management and Editor of the Journal of Portfolio Management. He is an Affiliated Professor at the University of Karlsruhe's Institute of Statistics, Econometrics, and Mathematical Finance and on the Advisory Council for the Department of Operations Research and Financial Engineering at Princeton University. STEVEN V. MANN, PHD, is Professor of Finance at the Moore School of Business, University of South Carolina. He has published over seventy articles in finance journals and many books on fixed income and derivatives topics, including The Global Money Markets, Measuring and Controlling Interest Rate and Credit Risk, Securities Finance (as a coeditor), and The Handbook of Fixed Income Securities (as an assistant editor). Mann is an active consultant to clients that include some of the largest investment/commercial banks in the world as well as a number of Fortune 500 companies.